THE next generation of footballers made their way through the AFL draft on Thursday 22 and Friday 23 November, with a few familiar surnames among them. Former Frankston VFA stars Steve Hamill, Paul Williams and Paul Foot all shared the exciting, yet slightly relieving, feeling of seeing their sons get drafted alongside some of Australia’s best up-and-coming talent. Will Hamill (pick no. 30), Bailey Williams (pick no. 35) and Zac Foot (pick no. 51) will all be heading interstate to live out their dream of playing with the elite in the AFL. Hamill will be heading to the Adelaide Crows, Williams will go to the West Coast Eagles and Foot was drafted to the Sydney Swans. Will Hamill’s father and newly appointed Crib Point coach, Steve Hamill, said there’s something a little bit special about seeing all of their sons get drafted. “There was no guarantee of those boys going so it was nice for them to get picked up and it’s great to see a bit of symmetry of the dads who played together 20 years earlier,” Hamill said. “I’ve watched Bailey develop as a person and as a footballer/sportsman for a long time. He’s a different sort of character to Will but he’s a really nice fella too, and I think he’ll make a pretty good fist of it. Like many young draft prospects, Will had caught the eye of several AFL clubs leading into this year’s draft but was still no certainty of being chosen. “It’s one of those things, you hope as a dad, that he has enough skills and qualities that they’re looking for,” Steve said. “We always went with a hope, but it was never expected, it was a sort of relief I suppose. “These days a lot of the clubs will talk to lots and lots of kids about their footy, so we sort of knew he was around the mark, but no one ever guaranteed him anything. 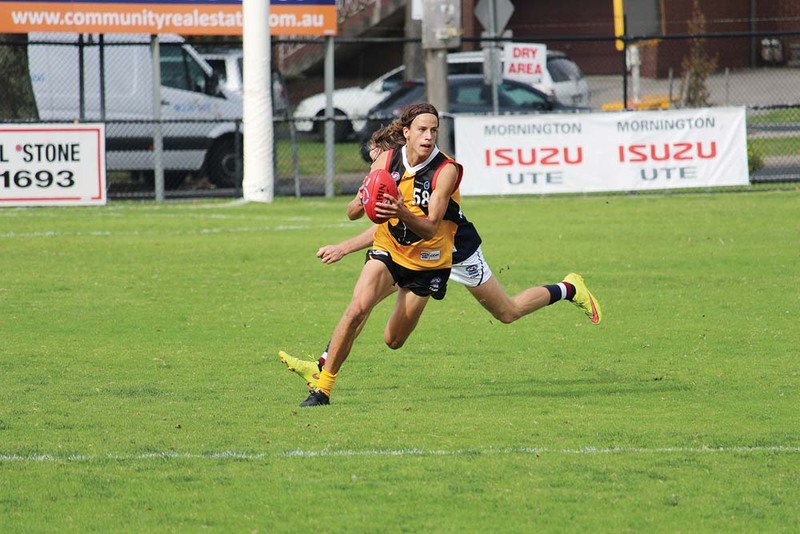 Will caught the eye of recruiters at October’s NAB AFL Draft Combine, showing off his speed in the 20m sprint with a third-place finish as well as ranking in the top 10 in the standing vertical jump, agility and Yo-Yo tests. Even with these results, it was still an exciting shock for Hamill’s name to be read out on live television. “We were just sitting there watching the TV. There wasn’t anything before that in regards to someone ringing up and saying they’re going to pick you now or that it’s going to happen, it was just wait for your name to be called out across the TV really,” Steve said. “It had been a dream that he had had for a while so in the first sense it was a bit of relief and then all of a sudden pride, and then there’s this sort of surreal feeling. “Within three minutes Don Pyke had rang and was on the phone speaking to Will and then Rory Sloane rang him, and Tex Walker was speaking to him. He had a big text from Mark Ricciuto and this all happened in the first 20 minutes. There was no time to lounge around for Will and the other draftees, with the boys flying out to join their interstate clubs on the Sunday. “[The draft] was Friday night and then he flew out to Adelaide on Sunday so that’s how quick it was,” Steve said. “Pretty much all the Victorian boys who got drafted were flying out that day so they all sort of shook each other’s hands and said ‘congratulations and good luck’. All the Adelaide boys who got drafted congregated together too so it was sort of nice that there was four or five of them flying out together. Williams and Hamill had played representative basketball together at the Western Port Steelers for the past five years as well as making their way through the Dandenong Southern Stingrays program with Foot and many other talented youngsters. The boys were part of the Stingrays’ 2018 TAC Cup premiership winning team that broke the club’s drought and claimed their first ever TAC Cup title. Also coming from the Stingrays, left-footed forward, Sam Sturt (Fremantle), was drafted at pick no. 17 as well as the speedy small forward, Toby Bedford (Melbourne), at pick no. 75. The rookie draft also saw Mornington’s Lachie Young get picked up by the Western Bulldogs. In regards to the Stingrays’ program, Steve couldn’t offer anything but a glowing review. Despite feeling incredibly proud to see his son get drafted into the AFL, Steve only hopes the best for the other talented footballers who fell just short of making it this year. “It’s such a cut-throat industry,” he said. “There were six boys that were lucky enough to get drafted this year, but I think Stingrays had a record number of kids invited to national or state combines so there was a lot of good boys who didn’t get picked up but in their own right could have if their number got called out.